*Disclaimer: This post contains affiliate links, meaning that I make a small commission on purchases made at no extra cost to you. Thank you for your support! You see, I love going on vacation and get excited to take in as many sights as we can when far away from home. Spend family holiday money checking out sights close to home, though? Well, then I become less enthused. For some reason, I take it for granted that we will always have another opportunity to experience the sights and sounds of home “another time.” However, I met another mom and her kids this weekend that has left me believing it may be time to count my staycation blessings. 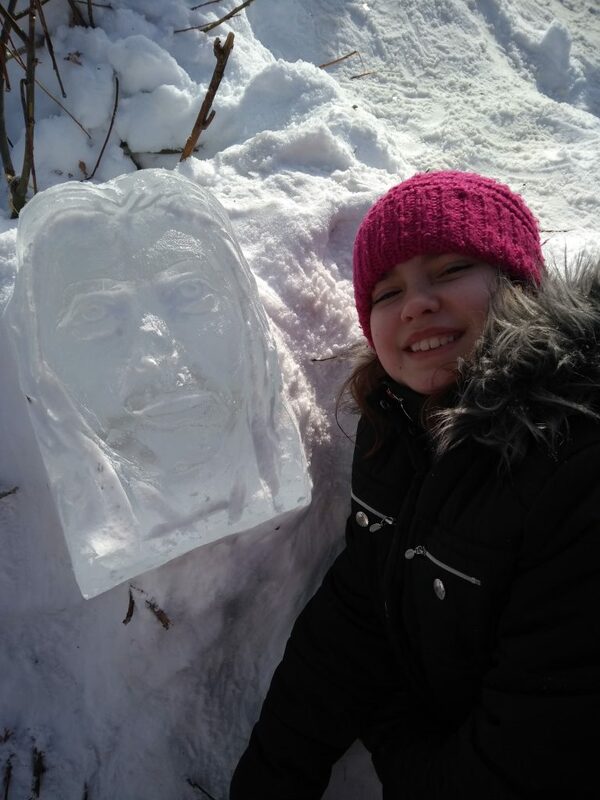 This ice carving is the first place Carvers’ Choice and People’s Choice winner. The detail is truly astonishing! It was carved by Karlis Ile and Maija Puncule from Latvia. A lovely passerby snapped this photo of us as we first arrived at Lake Louise and the Ice Magic Festival. 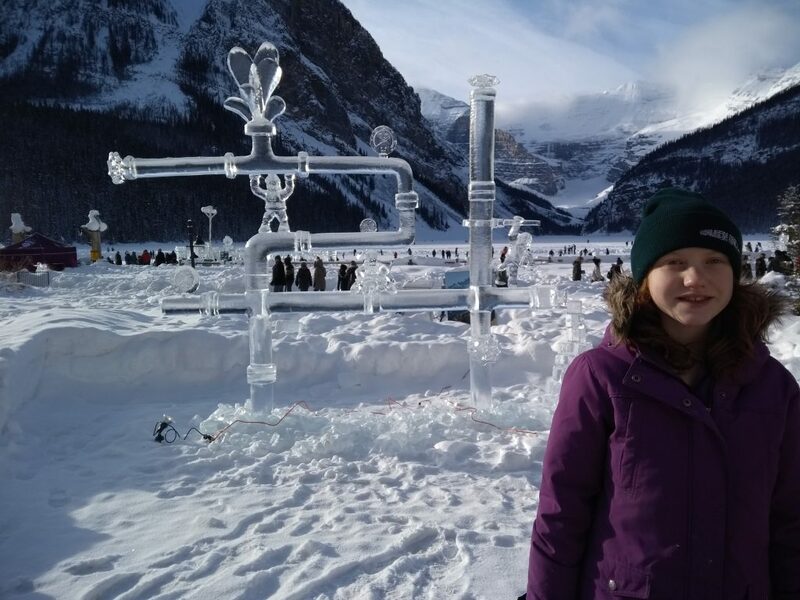 My youngest daughter in front of another amazing ice sculpture. 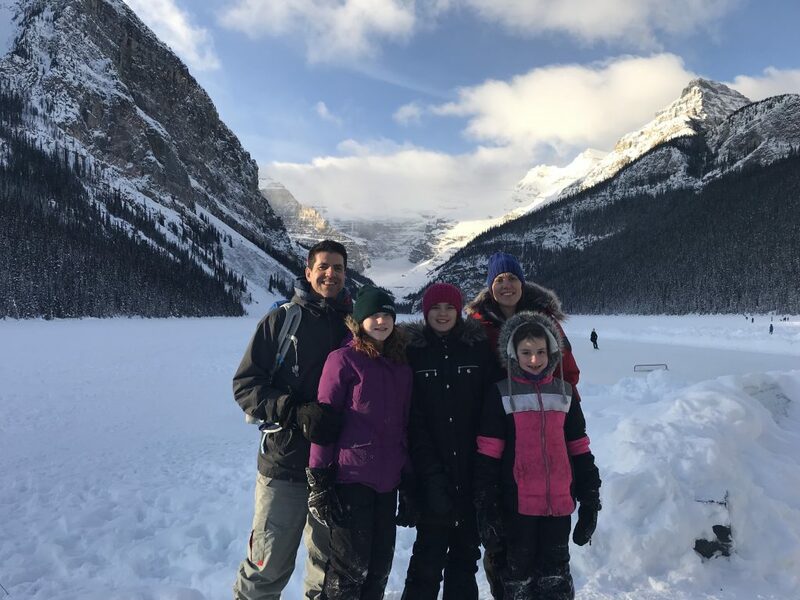 I was at the bottom of the sledding hill at Lake Louise making sure my daughters would stop on their sleds before flying onto the walking path. This other mom’s daughter joined my daughters sledding. Us moms introduced ourselves to one another. I discovered that she is from southern California and her son asked for snow for Christmas. 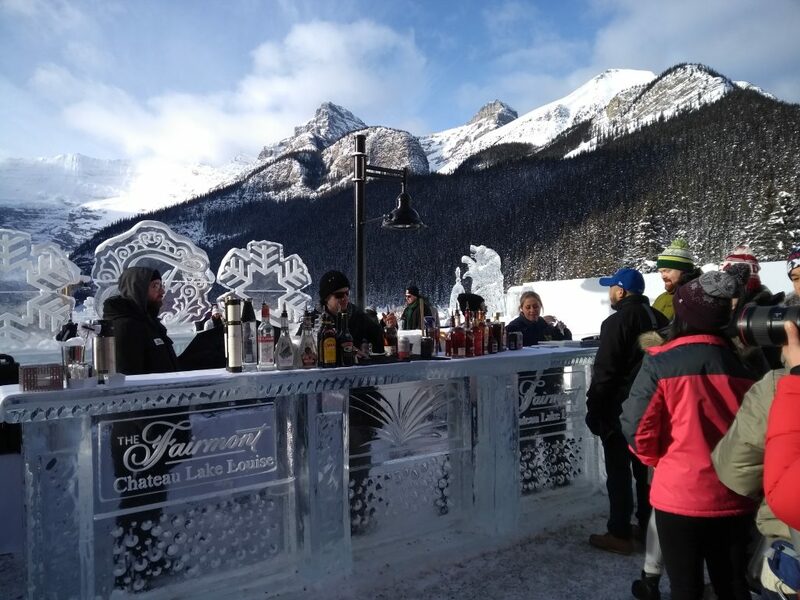 This is what brought them to Lake Louise and the Ice Magic Festival. It was their first time ever experiencing snow and the joys of winter. “Wow!” I respond, somewhat amazed that her son would ask for snow for Christmas. We continue to chat and I discover that they live only minutes away from Disneyland and are very close to a nice beach as well. Another one of my daughters standing in front of this 3rd place carving.carved by Rusty Cox and Steve Buzak from Canada. 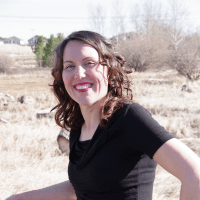 I find myself thinking about how much my children love experiencing winter activities as she shares how much her own children are absolutely loving their winter holiday. 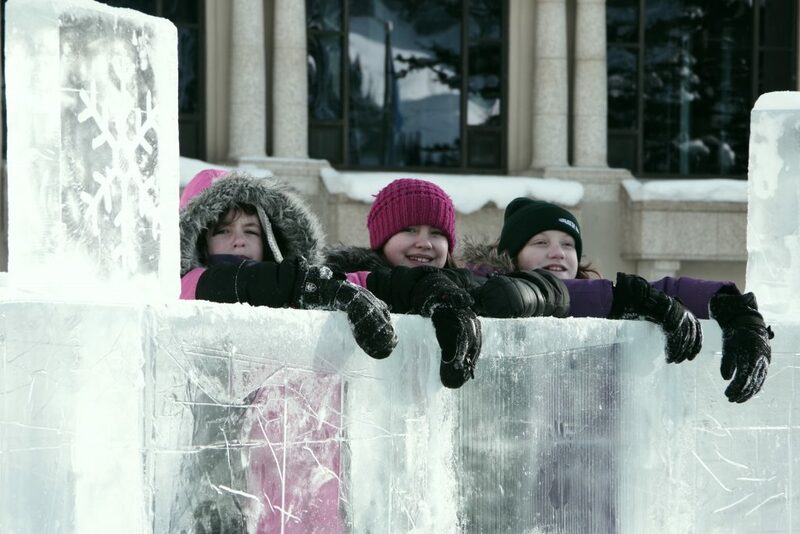 My husband, daughters, and I thoroughly enjoyed taking in SnowDays and the Ice Magic Festival this weekend. I am pleased that we didn’t hold off until yet another year. I guess we always thought it is so close that we can just go ‘anytime.’ The problem with that was that we still had yet to make it happen until now! The ice bar is open! Time to face the facts… 😉 This picture of my oldest daughter was taken just for fun! Another year seems to come and go. Finally, we make it a priority and end up loving it! I question why we don’t take the time to experience some of these relatively local attractions more often. It seems any vacation we take, we do our best to see and experience all that we can in the short time we are there. I never know when or if we will be back, so we decide to make the most of it. Yet why do I too often take for granted that there will always be a better day or time to check out amazing attractions close to home? This other mom has me realizing that we have our own version of Disneyland right out our back door and it is a blessing any time we choose to experience it! We likely all have some staycation blessings to count when we make the choice to count them. Even snow can be one of them! 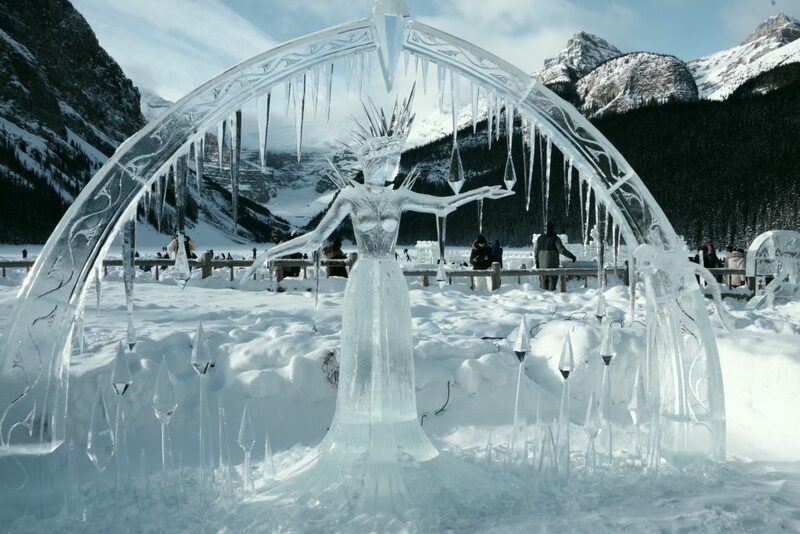 Lake Louise has ice sculptures. 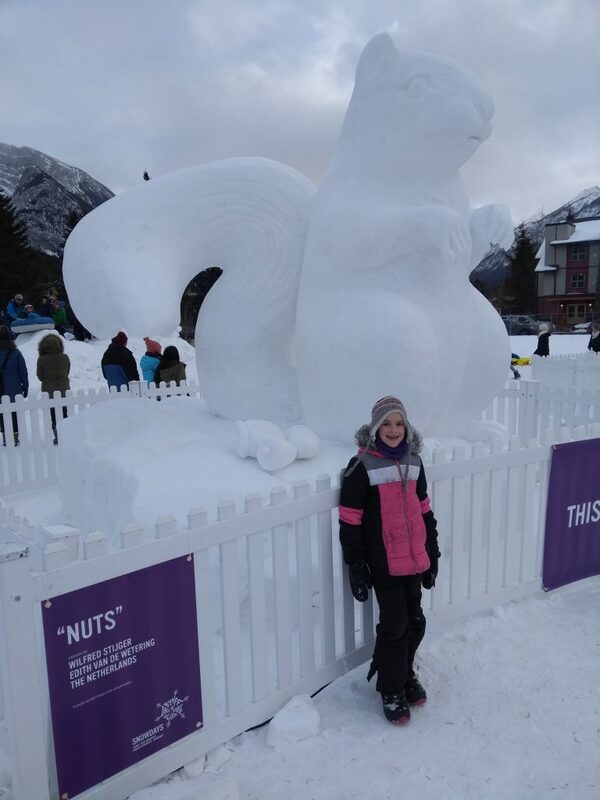 Banff has snow carvings. 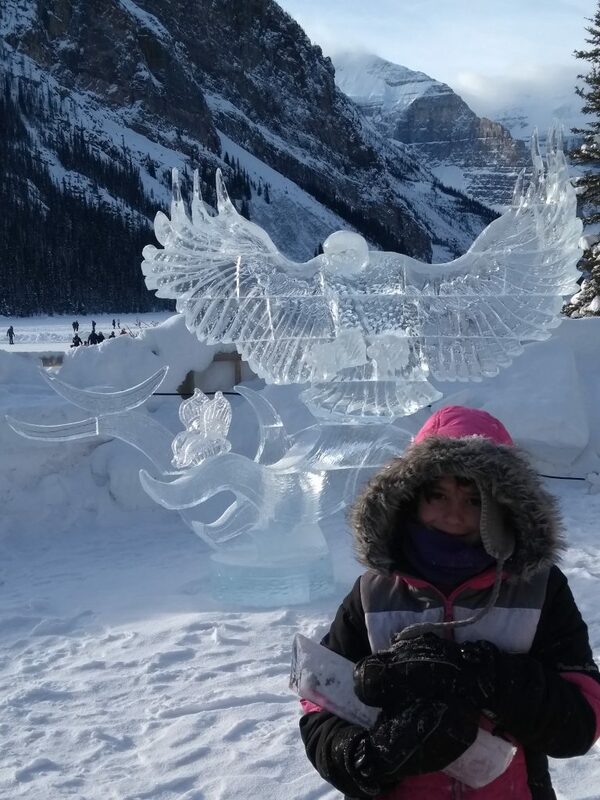 This is my youngest daughter in front of one of her favourite carvings in Banff. 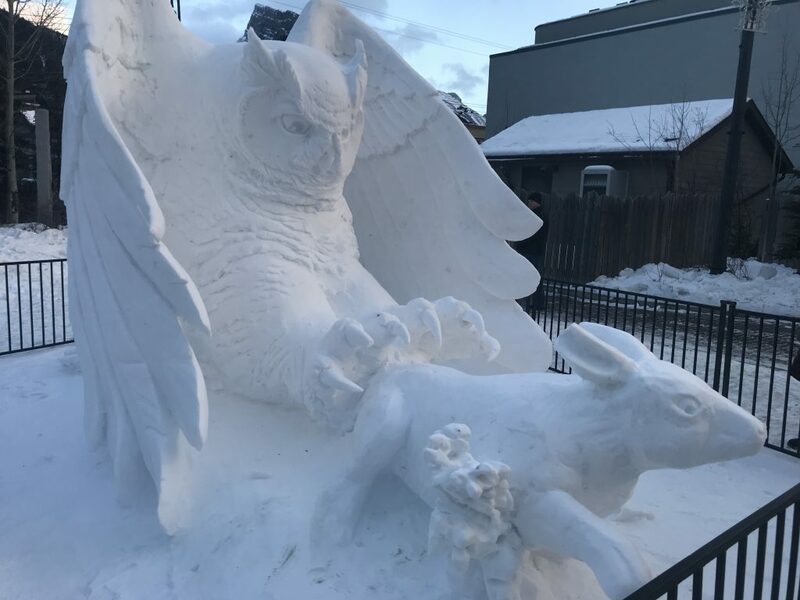 This is another incredibly detailed snow sculpture seen in Banff. Do you make the most of your local area and take the time to experience all that you can near you? Or do you tend to be more like I’ve been and take local opportunities for granted, finding yourself waiting for a better day or year? 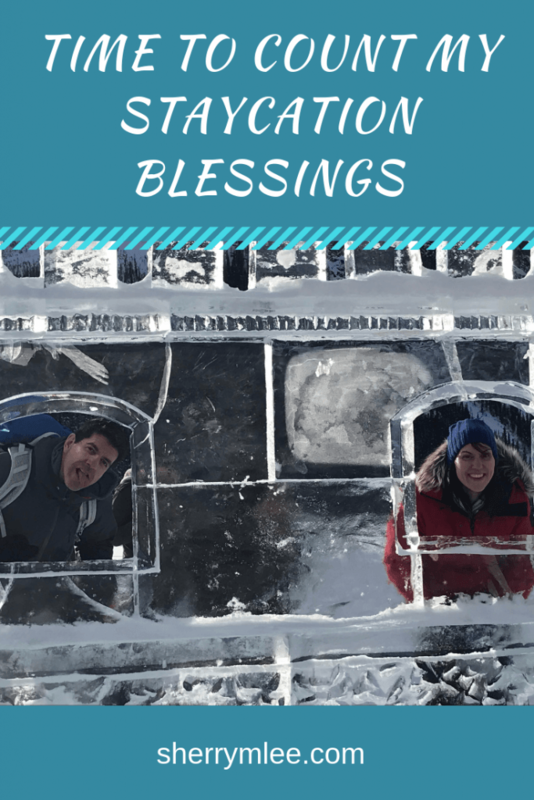 Do you ever count your staycation blessings? Let me know in the comments below. We love road trips, don’t take them as often, but it’s sad to say that I have never visited San Francisco or all of the beautiful sights California has to offer. I think like you we always take it for granted because we know it’s there. Hopefully this year we can take more short road trips. Beautiful pictures, it looked like so much fun. I try and be a tourist in my own town but sometimes you forget. I have heard Lake Louise is beautiful and the pictures back it up! I live these photos. My children would also be enthralled by this. We have a small town about three hours from us that does this, and we still haven’t taken the children. Maybe we should. We have done other close things like hike to the waterfall that is just outside our town. When family visit us, we try and think of what we can do locally to show them around, but there is still a lot in Seattle that I still haven’t done. Those ice sculptures are amazing! Last year my husband and I took a little staycation in Cleveland, Ohio which was very enjoyable. It looks like you guys had a great time! Aren’t they, though? They sure are spectacular! That’s great that you have done a staycation. I’ve never been to Cleveland, but would love to someday! We have done a staycation before. It was really fun. It was the best we could do as money was tight. That’s awesome! It is great to get a break from the regular routine and take in some new sights and experiences whether traveling far or staying close to home. My daughter loved Banff so much now she is adamant it is her favorite place in the entire world. I love the photos, those sculptures look amazing and so impressive! I relate to this so much! We get caught in the day to day life so much and dream of far off destinations that we often forget to enjoy what is around us. I guess it’s a grass is always greener mentality. I’m so glad you guys finally got to go and shared it with us. Those sculptures are amazing! Beautiful pics! I live in Newfoundland and I love just road tripping around. There is something about the scenery that always takes your breath away! My one daughter is begging us to go to Newfoundland! She has been looking at pictures and insists we must visit there. It’s on our wish list of places to go for family vacations!